BBC Proms is a truly original event and a firm favourite amongst those looking for corporate entertainment! Sadly the BBC announced this January that the sister event BBC Electric Proms was to be cut due to the financial cutbacks. 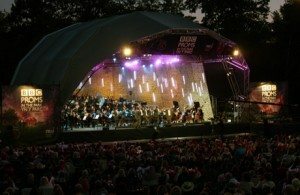 However BBC Proms in the Park has announced a superb line-up for this years Last Night, full of inspiring and hugely talented artist ranging from Katherine Jenkins to the celebrated pianist Lang Lang. The inimitable Ken Bruce from BBC Radio 2 will kick the party off with sets from artists such as The Overtones and Deacon Blue. This years special guests are Westlife, one of the most successful bands of the last 15 years with no less than 14 number hits to their name. The Last Night is perhaps the day that most people get their perceptions of the BBC Proms in the Park (the Proms season actually last around two months), as the event is shown on BBC One and Two and often features patriotic British pieces, such as Land of Hope and Glory and Jerusalem (fantastic!). 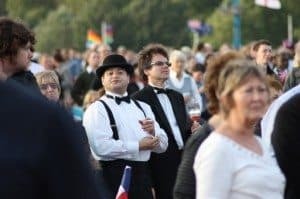 The audience often wear fancy dress and ranging from the quintessential English bowler hat to exuberant Union Jack t-shirts. Our corporate hospitality presents a wonderful opportunity to attend arguably the most sought after night of the Proms season with all the glamour of a VIP experience. For more information click here for BBC Proms client entertainment. Here’s some interesting facts about BBC Proms in the Park to leave you with! To book in advance regular seated tickets for the Last Night celebrations, guests must have purchased at least five tickets to the events in the Proms season. Guests can chance waiting for the advanced booking period to end but more often than not the Last Night is sold out. The Last Night celebrations are so popular that in the past the only way to obtain tickets was through a postal ballot. In the past it has been known for Prommers to queue up outside the Royal Albert Hall three weeks in advance to guarantee a good standing spot for Last Night Celebrations held there. The bust of Sir Henry Wood at RAH is often scene to gently visual jokes such as wiping a bead of sweat from his forehead. It’s tradition to sing Auld Lang Syne at the end of the concert. This was once broken by Scotsmen James Loughran in the late 1970’s.